The Shroud of Turin has long been a source of reverence and intrigue. Considered one of the most important Christian relics, many believe it to be the burial shroud of Jesus Christ, due to the faint image visible on its surface that appears to show a naked man bearing wounds consistent with crucifixion. While some consider it a miracle, others search for a more scientific explanation for its existence, and researchers from the Politecnico di Torino have come up with a theory that they believe might provide some answers. They say that it's possible that neutron emissions from an earthquake around the time of Jesus' death could have created the image, as well as affected radiocarbon levels that suggested the shroud was a forgery from medieval times, reports LiveScience. Their theory about creation of the image is supported by elements of the historical record, as an earthquake did indeed rock Jerusalem around the time of Jesus' believed death around 33 AD. A. Carpinteri, G. Lacidogna, and O. Borla simulated the earthquake by crushing brittle rock specimens, and found that neutron emissions could have come from such an event. These emissions could have caused chemical reactions in the cloth forming the image of a face. Hypotheses and experimental confirmations that oxidative phenomena generated by earthquakes can provide 3D images on the linen clothes have recently been proposed by de Liso . Moreover, a further effect of neutron irradiation could have provided a wrong radiocarbon dating due to an increment in C146nuclei in the linen fibres. The scientists linked the earthquake with Jesus' death by citing Greek historian Thallos' account of the day Christ died, the gospel of Matthew, and the narrative of Joseph of Arimathea, as well as with the work of Dante Alighieri, writing, "Moreover, if we assign the image imprinted on the Shroud to the Man who died during the Passover of 33 a.d., there are at least three documents in the literature attesting the occurrence of disastrous earthquakes during that event." Some are interpreting these findings as a testament to the Shroud's authenticity, as it claims the medieval radiocarbon dating done by Oxford University in 1988 is erroneous. However, other scientists doubt the results of the study, pointing out that radiocarbon dating from other seismically active areas like Japan has generally not been considered inaccurate. "People have been measuring materials of that age for decades now and nobody has ever encountered this," Gordon Cook, a professor of environmental geochemistry at the University of Glasgow, told LiveScience. This isn't the first time a radiation theory has been proposed, however. 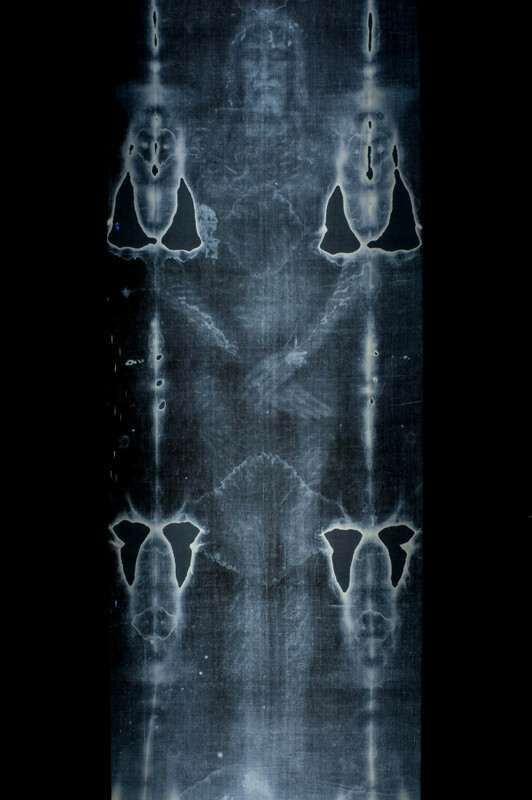 In 2013, Giulio Fanti and a research team from the University of Padua conducted a test which dated the shroud from between 300 BC and 400 AD. This picture taken on February 20, 2012 shows a Facsimile of 'The Shroud of Turin' at the Cathedral of Malaga.